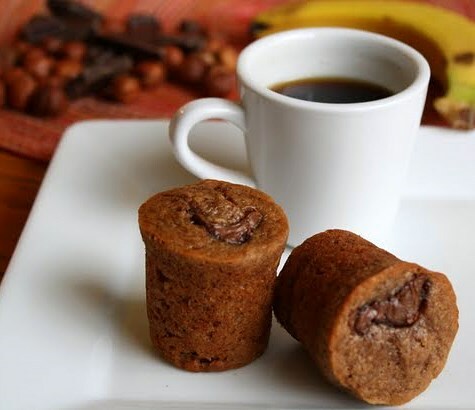 Banana Nutella Mini-Muffins . . . It's Never Too Late! 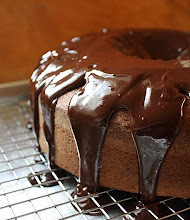 Despite the fact that I completely missed World Nutella Day on February 5th, I figure better late than never, right? 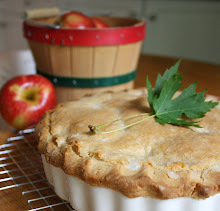 I must have been sequestered in a remarkably secluded cave, or just not paying any attention that day to current baking-and-blogging events, because I heard nothing about it until after the fact. 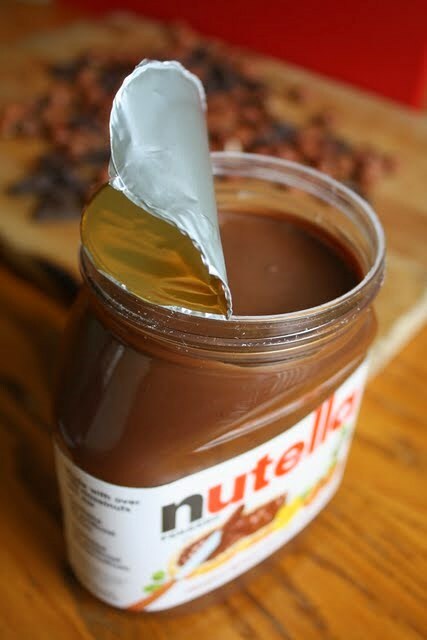 This was unfortunate, because an unopened jar of Nutella--that divinely spreadable combo of hazelnut and chocolate--had been haunting my basement baking cupboard for a quite a few weeks. No ordinary storage space, this small pantry on wheels is a repository of unusual and/or pricey baking ingredients that I'm loathe to let into the general population of food items in my household. It's where I hoard cocoa nibs, cinnamon sticks, and vanilla beans. Where I protect super-premium chocolate, jars of really good imported jam or citrus curd, and hard to find honeys from the prying fingers of my kids. It's also where I store exotic and breakable bottles of orange flower water, rosewater, extracts, oils, and sweet liqueurs to use as flavorings. It's just one of several spots here and there in my kitchen, dining room, and basement that house the many and varied accoutrements of my baking obsession--but that little storage spot is the most rarified of them all. It's a wonder I've never thought to padlock it . . . or maybe booby trap the doors . . . Anyway, I know Nutella's hardly rare and not especially costly, but that lone jar of Nutella was down there because it wasn't quite safe anywhere else. The only options, as I saw it, were to keep that chubby brown jar under house-arrest in the quiet darkness of the cupboard or force it into the federal witness protection program. Desperate times call for desperate measures. 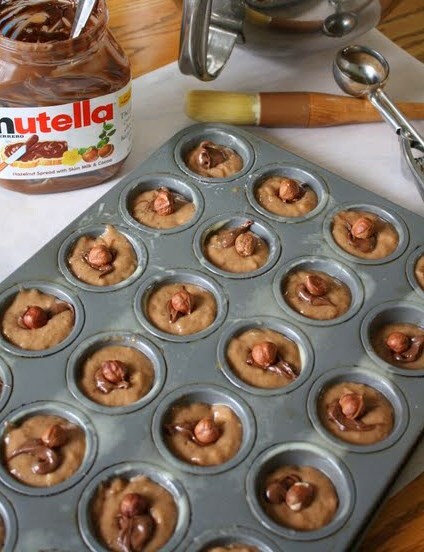 If you're a fellow Nutella fan, I know you understand. This muffin formula was inspired by or, if you prefer, adapted from, a recipe for peanut-butter banana bread found in Cooking Light magazine's October 2010 issue. The original PB banana bread recipe can be found online by clicking here. I made a number of changes to the original, resulting in these incredibly moist and tasty muffins. To say I was pleased with how these turned out would be an understatement. My family loved them--especially Nathan, the 14-year old. He's brutally honest about anything I bake and never sugar coats his opinion (pun intended). I know I've produced something good if he gives it a thumbs up. Among my alterations to the original recipe: I used sour cream instead of plain yogurt; I substituted Nutella for crunchy peanut butter; I used 1/3 of a cup of fresh hazelnut meal (finely ground hazelnuts) instead of 1/4 cup of ground flaxseeds; I omitted the spices entirely (cinnamon and allspice were called for), and I added in a modest splash of vanilla extract; I also dabbed a little bit of Nutella onto the top of each muffin before baking, and topped some of the unbaked muffins with a single, toasted, whole hazel nut. 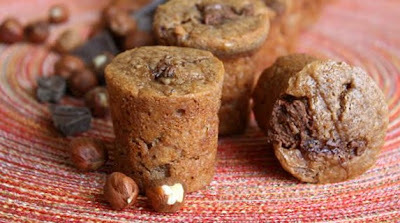 This recipe could easily produce 48 mini muffins, or up to 24 regular size muffins. Before we get to the actual recipe, I wanted to mention that I used two different pans for this batch. 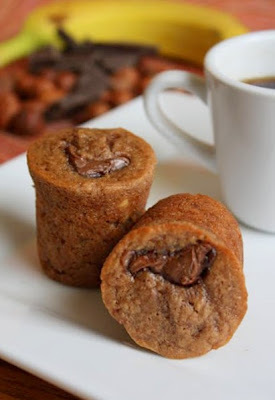 The cork-shaped muffins were made using a Nordicware mini-popover pan--a sturdy piece of bakeware that I am pretty darn happy with; it has 12 cups. I bought that pan about three weeks ago, for myself, as a 50th birthday present. Every girl should buy herself a few well-deserved birthday presents when she hits a milestone year like that, don't you think? (Those are, of course, in addition to gifts received from friends and family! 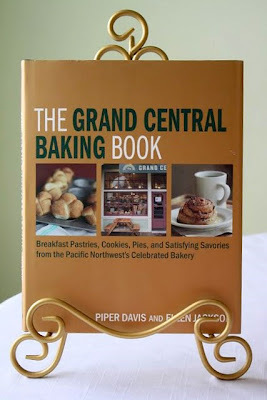 :) I haven't tried using the pan yet for popovers, but they're on my to-do list. I also used a regular 24-mini-cup pan, and I ended up with enough batter leftover after all that to make one jumbo muffin (I tossed the singular jumbo into the freezer as soon as it cooled off--can't be too careful). 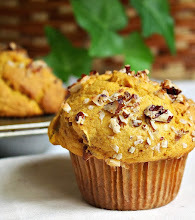 Since these muffins lean toward the richer side of the muffin spectrum, the smaller size seemed just right. Preheat oven to 350 degrees. Using baking spray or muffin liners to make 48 mini muffins, or 24 regular size muffins, or about 13 jumbos. 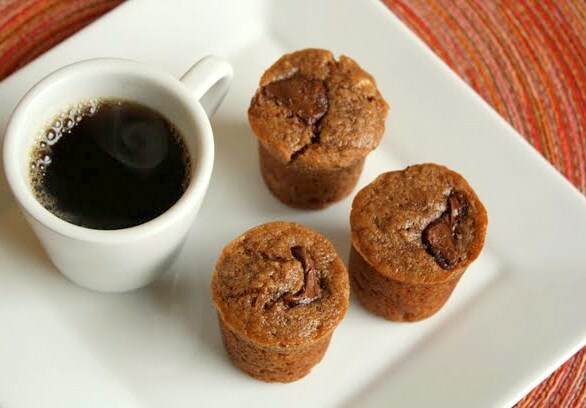 About 1/4 cup softened Nutella, to dab on top of the unbaked muffins. 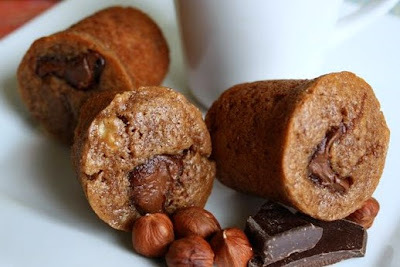 A few dozen whole unblanched hazelnuts, if you'd like to top the unbaked muffins with them. 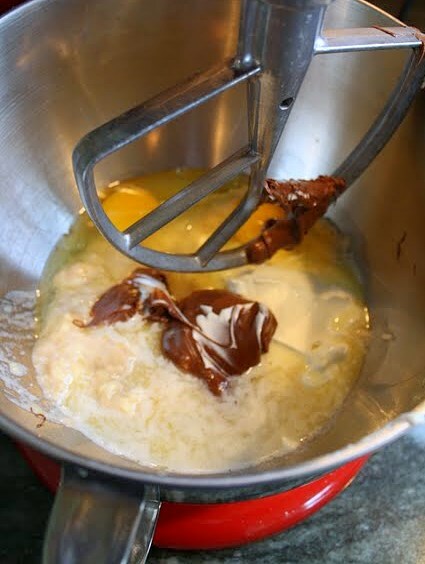 In a large mixer bowl, using the paddle attachment on medium speed, blend together the banana, sour cream, 1/3 cup Nutella, melted butter, and eggs until very well combined (at least a couple of minutes). Add in the sugars, beating until well blended. 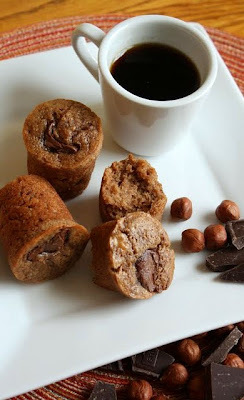 In a separate bowl, whisk together the flour, hazelnut meal, baking soda, and salt. Stir this into the liquid mixture, or blend it in using your mixer's lowest speed, just until combined. Don't overmix. 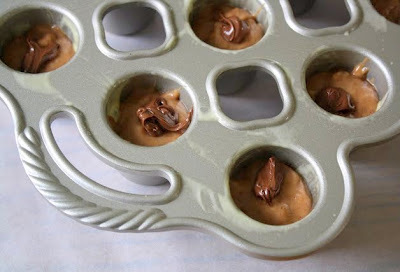 Using a small portion scoop, if possible, fill the muffin cups about two-thirds full. Dot the top of each with a dab of softened Nutella; use less than 1/2 a teaspoon for each one. 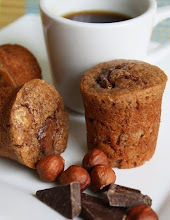 If you like, add a single hazelnut to the top of each muffin. 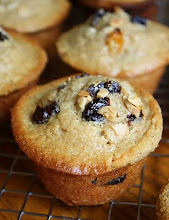 Bake the muffins for about 12 minutes or so, until a toothpick inserted comes out clean. 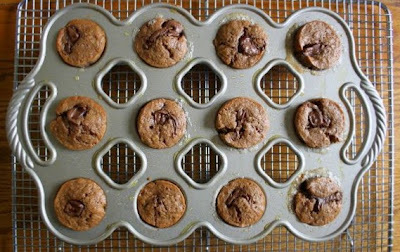 Let the muffins cool in their pans, on a rack, for a few minutes. 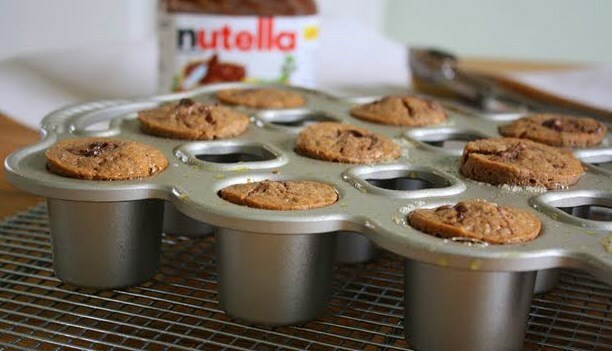 Remove the muffins from the pans and let them cool further on the rack. What I choose to bake on any given day usually depends on four things: how much time I have; which ingredients are already in my cupboard; what I'm in the mood to prepare; and, whether or not my family members are likely to show enthusiasm for the dish I'm contemplating. 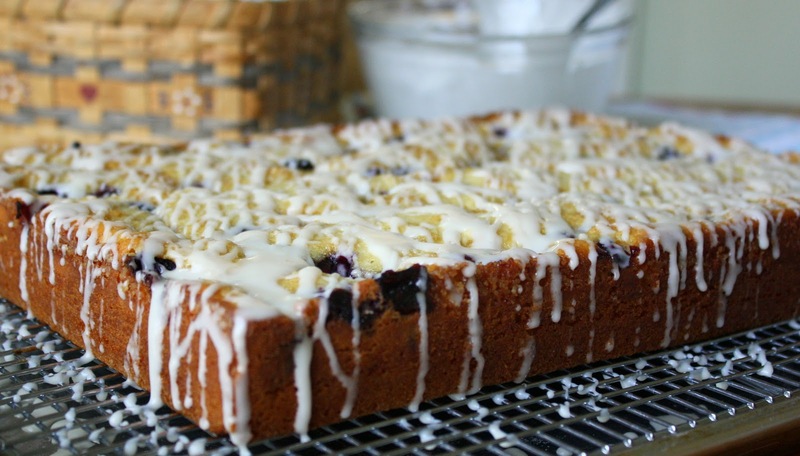 Even with those limiting factors in play, the inherent freedom of home baking and the creative liberties that it allows make up an enormous part of what I love about the whole process. It's encouraging to know that just about anyone can combine a bunch of seemingly disparate ingredients and be rewarded with a tasty, and often impressive, result. Taking into account all of the customizing and occasionally fool-hardy recipe tweaking we chronic bakers tend to engage in, that's comforting knowledge, don't you think? I suppose it's sort of like one's faithful acceptance that a car can be driven to its intended destination even if the windows have been tinted purple, the radio's been replaced by a waffle iron, and the interior's been reupholstered in pink crushed-velvet. 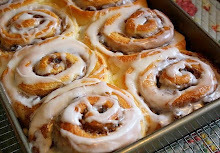 Baking is similarly flexible, at least to a certain degree. Just remember, figuratively speaking, not to remove the car's engine and everything should be okay. When the yen to bake strikes, I try to zero in on a recipe that satisfies that familiar quartet of requirements, yet still leaves room for interpretation. 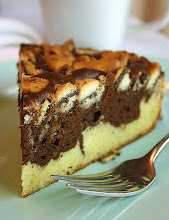 This coffee cake provides an uncomplicated case in point. 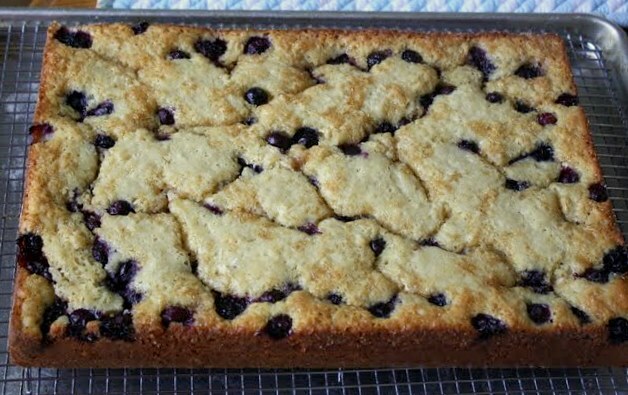 Last weekend, with a grand total of about two hours available to me--start to finish--I assembled this yeasted coffee cake (or kuchen, for those of you who prefer to sprechen zie Deutsch!) without any stress or strain. 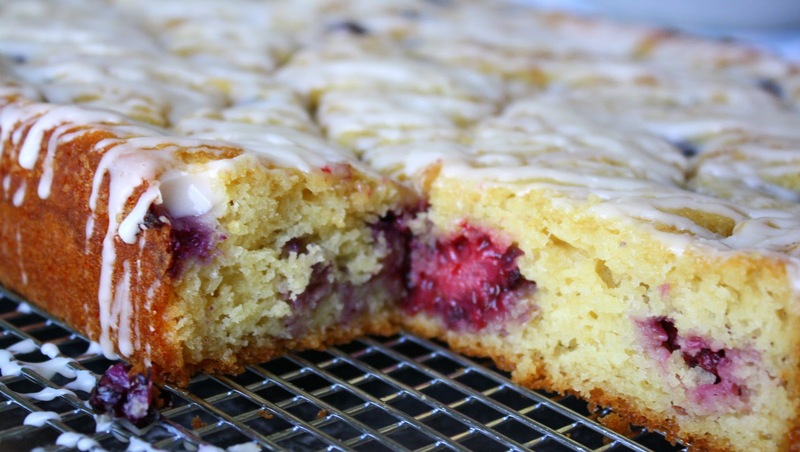 Adapted from The Grand Central Baking Book, by Piper Davis and Ellen Jackson (lots of good stuff in this beautiful book), the original formula called for three cups of red raspberries and cherries. 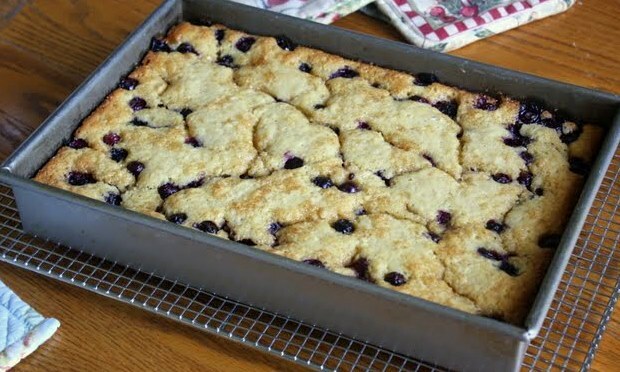 I had neither of those in my fridge, but I did have a few handfuls of blackberries and blueberries that were almost overripe, so I subbed in a scant two cups of those. 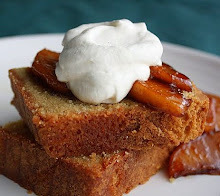 The recipe called for turbinado sugar; I didn't have that so I used coarse, moist Demarara sugar instead. 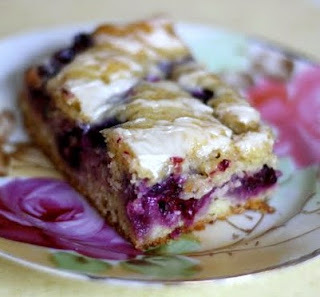 (If neither of those happen to inhabit your pantry, just use our old stand-by, brown sugar). 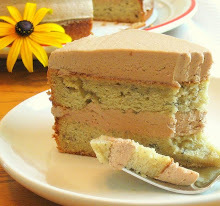 The instructions also called for active dry yeast, as most home-baking cookbooks tend to do, but I opted for instant yeast; though harder to find in stores, it's easier to use than active dry (no proofing needed) and, in my experience, more reliable overall. This baby was thrown together without the aid of a mixer, all in about 20 minutes--no kidding. 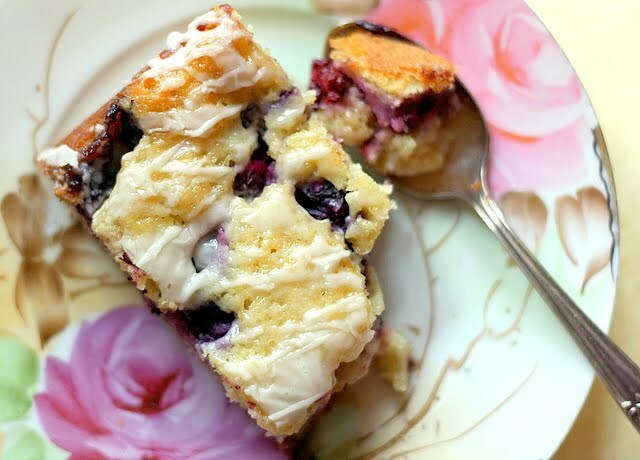 The dough rose in its baking pan for almost an hour, then it was topped with the berries, sparkly golden sugar, and finally it was drizzled with melted butter. When it emerged from the oven about 40 minutes later, looking like a dream, I knew the planets had aligned perfectly once again. I love it when the world works like that. Lightly grease and flour a 9" x 13" baking pan, or use baking spray. In a small bowl, whisk the eggs just to break them up. 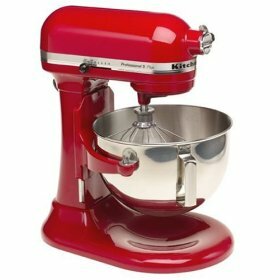 In a large mixing bowl, whisk together the flour, salt, and instant yeast. Pour the eggs and the milk mixture into this, stirring gently, just until combined. 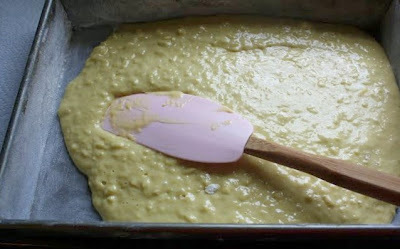 Spread the batter into the prepared pan and cover it with plastic wrap. 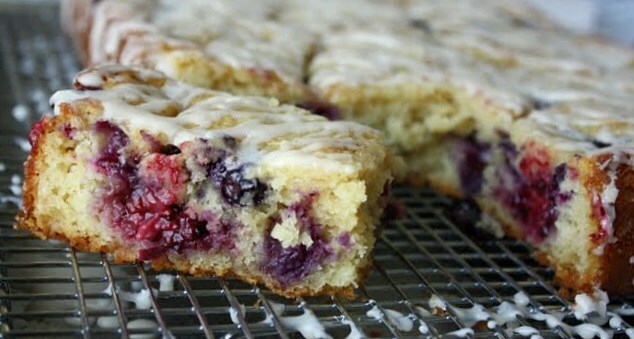 Once the batter has risen, scatter the berries over the top evenly. 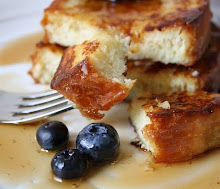 Sprinkle the Demarara/Turbinado sugar all over the top and drizzle the melted butter over that. Bake uncovered on the middle rack for 25 to 30 minutes at 350 degrees; then decrease the oven temperature to 325 degrees and bake for another 10 to 15 minutes. 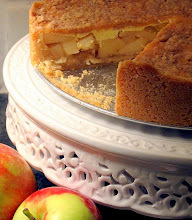 The cake is done when it's lightly golden on top and darker golden near the sides. 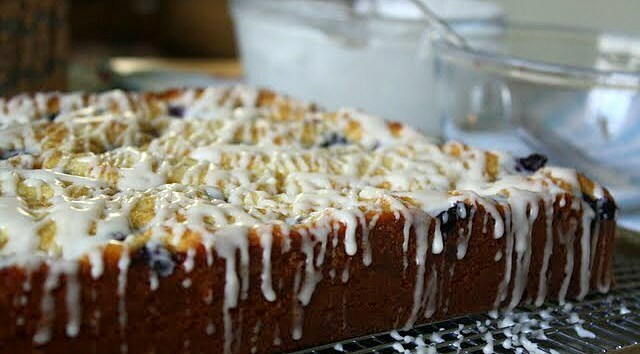 While the coffee cake is baking, mix together all of the glaze ingredients in a small bowl, stirring until completely smooth. Let the kuchen cool in its pan, on a rack, for five to ten minutes. Then, invert it onto another rack or onto a sheet pan, then invert it again so it's right side up on the cooling rack. Place the cake, on the rack, onto a sheet pan with sides, and drizzle the glaze all over the top with a spoon or whisk. 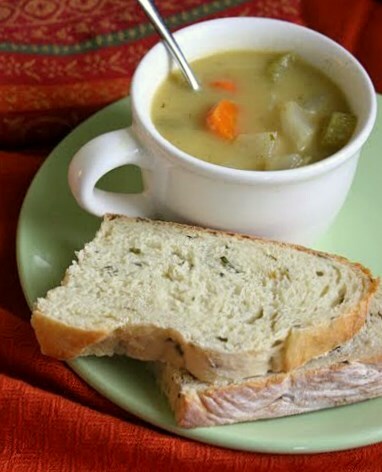 Really good when served warm, and definitely best when it's extremely fresh. I don't mean to shock you, but we're not going to talk about bad weather. We're not going to rant about ice and snow. Nope, we're going to pretend it's a pleasant 80 degrees. You know the phrase "willing suspension of disbelief," right? Well, that's what will be required of us. So put on those rose-colored glasses. Try to think warm thoughts. Mentally meander back to the last time you tasted something that was the absolute antithesis of winter. I'll bet it was gloriously sunny outside, you were wearing something light and airy, and though it was around 7pm sunset was still at least two hours away. Does that scenario ring a distant bell? It does for me. We're going to recreate that moment, if only in our imaginations. To nudge the dream along, I recommend this incredibly simple but flavor-packed sorbet. You can concoct this with the strained pulp of fresh strawberries, of course, and if it's actually summer in your corner of the world and you have access to local berries, then by all means go for it. But if imported strawberries are your only option you may need an alternative. Let's face it, after the bumpy journey across a couple of international borders, how could any tender berry not be tuckered out? 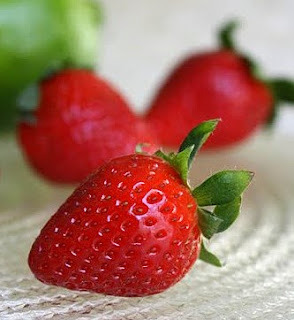 Those winter strawberries may be pretty, but their luster is often superficial, their joie de vivre a thing of the past. Are they even slightly sweet? Don't lay odds on it. Only way to tell is to buy 'em and try 'em, and that's a calculated risk. 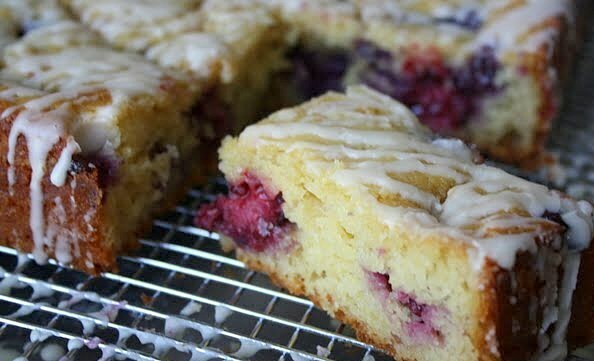 If you don't want to chance it with imported berries, use frozen pure-fruit pulp (don't scoff, pastry purists!). 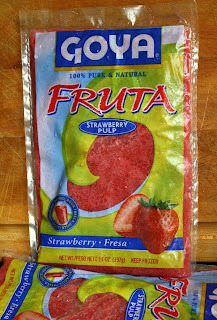 It's the neatest thing to pluck from your freezer, on a whim in the dead of winter, a couple packages of this stuff and use it to create something so delectable. 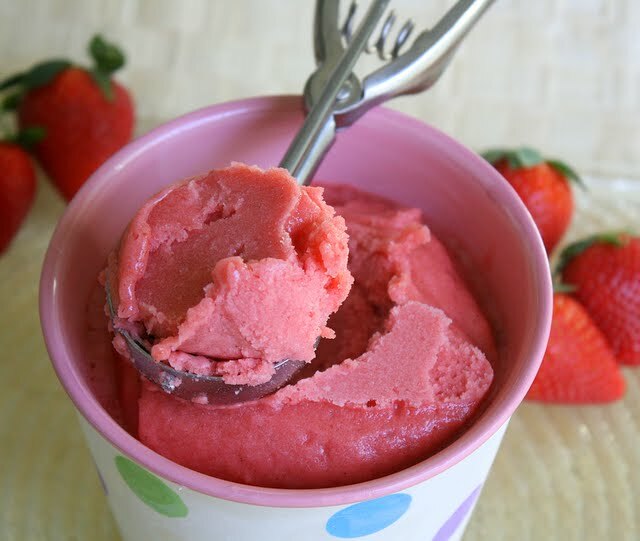 If, however, you had the foresight last summer to freeze bags of your own strawberry puree, prepared from super-fresh fruit that you picked yourself, please pat yourself on the back because, frankly, you are a genius. Not all of us are that prescient though, which is why I used two 14 oz. 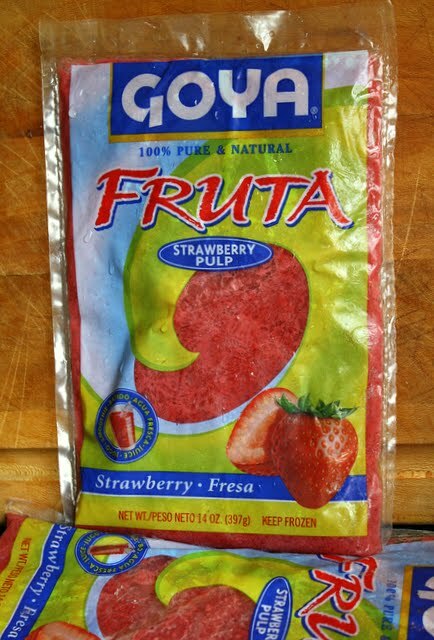 packages (only about $2.00 per pack) of strawberry pulp that I'd purchased last fall from a wonderful Detroit market specializing in Central American foods. Called The Honey Bee La Colmena, this store's slogan is, "Wake up and smell the chorizo." Next time we visit The Honey Bee, I'm going to stock up and try the mango and passion fruit purees, too. It's good stuff. 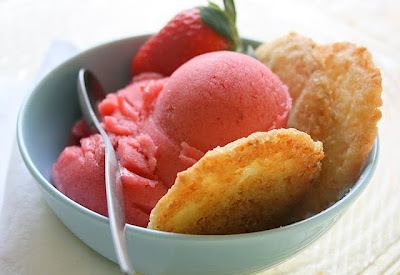 This sorbet recipe, adapted from the book Professional Baking, by Wayne Gisslen, is so easy it's hardly a recipe at all. 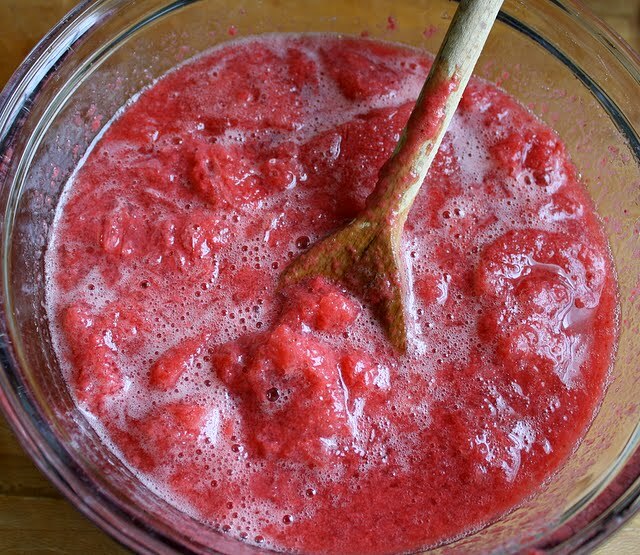 Sugar and water are cooked to a syrup, then mixed with the strained fruit puree/pulp (frozen or fresh). 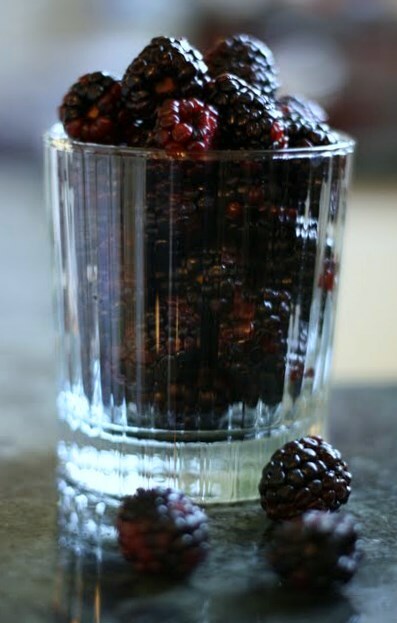 I decided to add in a teaspoon of Chambord, a sweet French liqueur made from red and black raspberries, to improve the texture of the final product (the tiny bit of alcohol helps keep it from freezing rock hard). 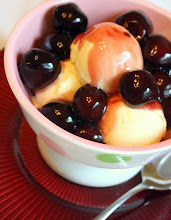 The liquid mix is chilled for a few hours, churned in an ice cream maker, and then plunked into the freezer until firm. 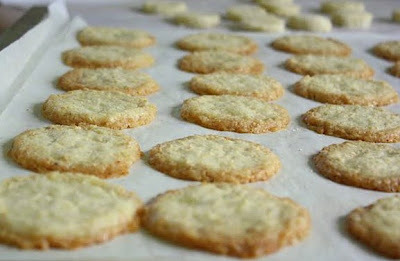 This thin coconut-lime cookie is a nice one, too. 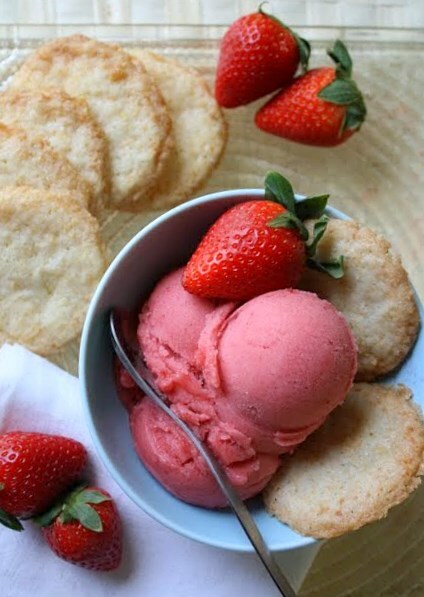 Not heavy-duty like shortbread, nor fussy like a tuile, these just-delicate-enough coconut wafers are jazzed up with a little lime zest and juice. Dessicated coconut (dry, finely shredded, and in this case unsweetened) gives them a pleasing nubby texture. 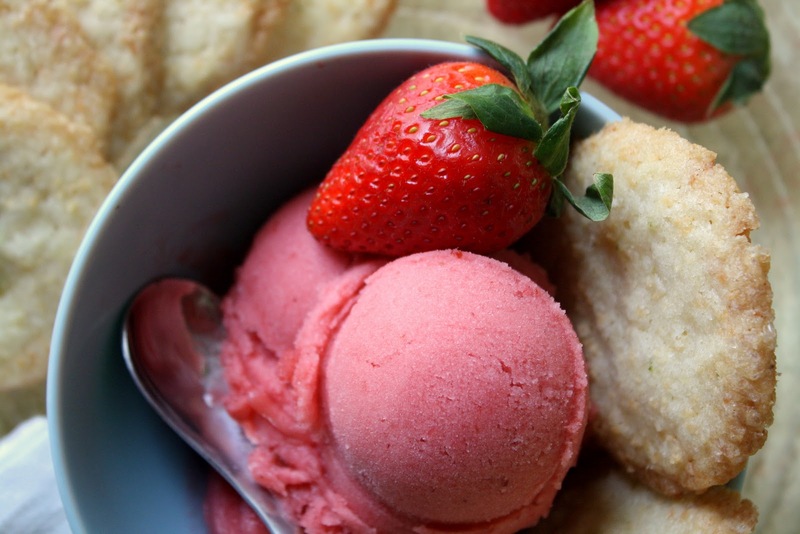 These cookies are a great sidekick to the sweet and tangy sorbet. I adapted the cookie recipe from Classic Stars Desserts, by pastry chef Emily Luchetti. 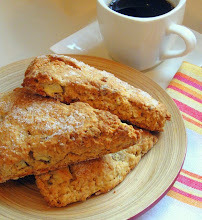 Her original formula called for sesame seeds, sliced almonds, and sweetened shredded coconut. That all sounded fine, but in this case I thought it might make for an overcrowded cookie, so I omitted all of those, switching in the lime, a smidgen of almond extract, and using the dried unsweetened coconut as described above. I also rolled the chilled dough in sanding sugar before slicing and baking (these are basically refrigerator cookies). 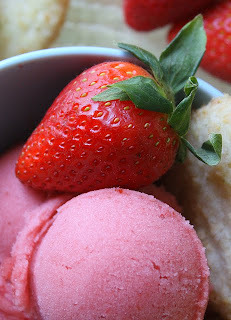 You can make this dough well before you need to bake it since it needs time to chill. In terms of scheduling your real life, these cookies dovetail cooperatively with the sorbet; they're both desserts that conform to your schedule versus the other way around. Not sure that's ever happened to us before! In a large saucepan, heat the sugar and water over a medium flame until the sugar has completely dissolved, stirring now and then. Remove the pot from the heat and let the mixture cool. Stir in the fruit puree and the Chambord. 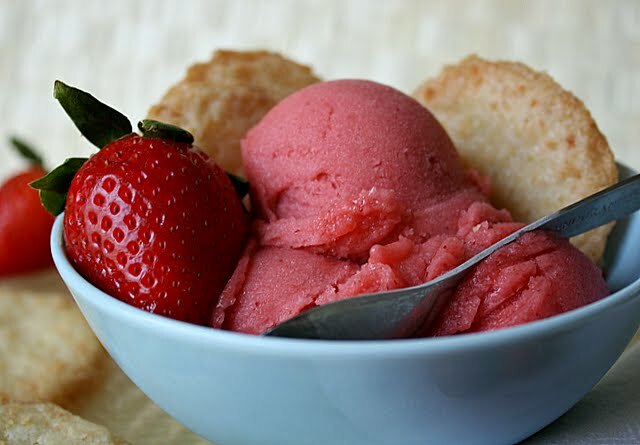 Chill in the refrigerator in a well-sealed container for at least several hours. Churn in an ice cream maker according to manufacturer's directions. 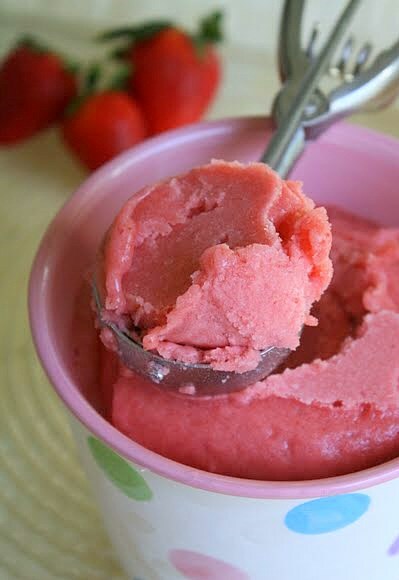 Pour the churned sorbet into a clean container, seal it, and freeze until firm. 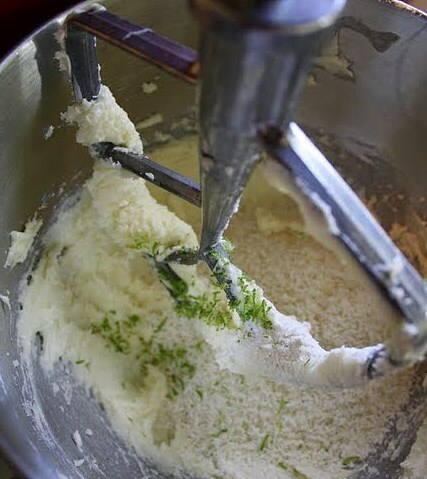 In the bowl of your mixer, using the paddle attachment, beat the butter and sugar on medium speed until smooth (should be less than one minute). 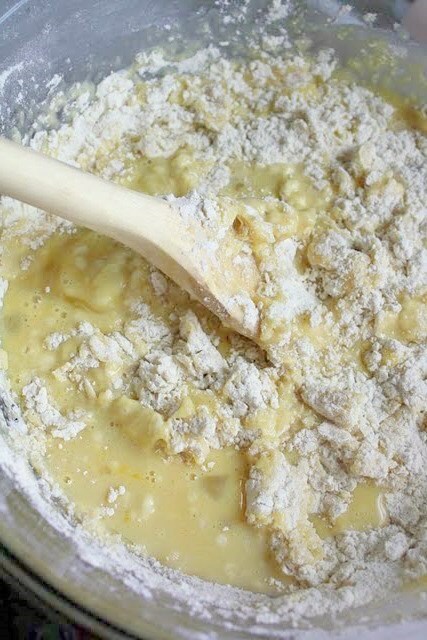 On low speed, add in the flour, coconut, almond extract, juice, and zest. Mix just until well combined. 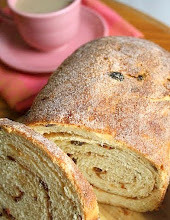 On a lightly floured sheet of parchment paper, roll the dough into an 18" log. 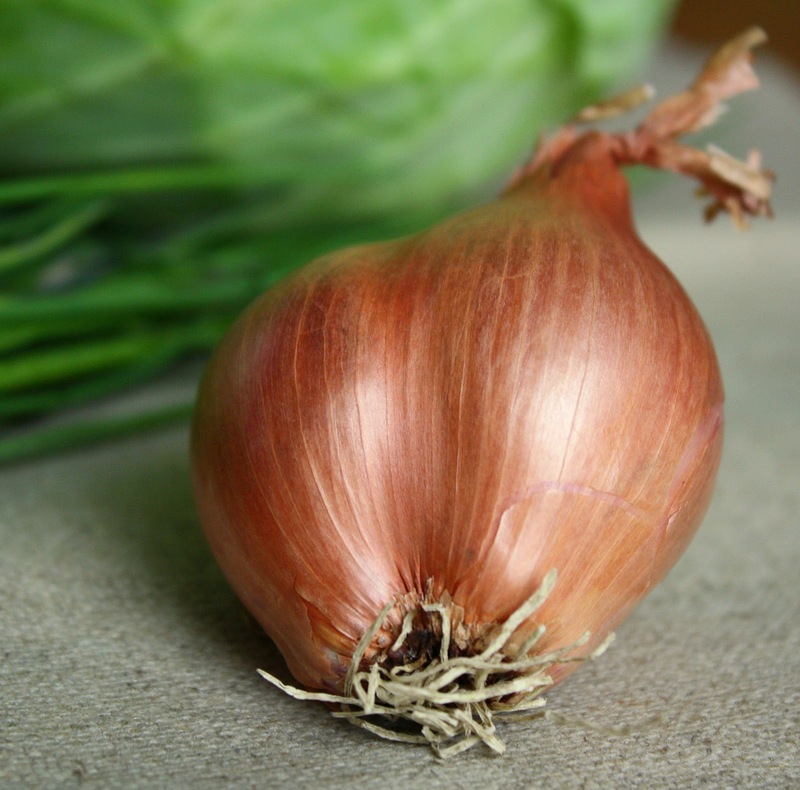 Wrap the parchment snugly around it, maintaining its shape as you go. 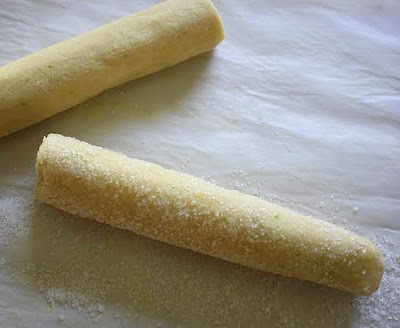 If you like, preserve its shape by sliding the wrapped dough into an empty paper towel tube. 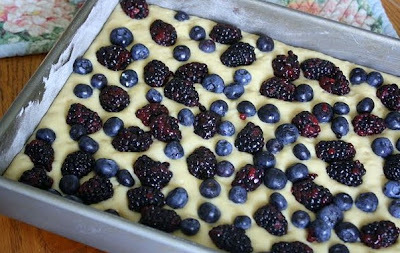 Place the dough into the fridge or freezer to chill until it's quite firm (at least half an hour in the freezer, or an hour or more in the fridge). About 20 minutes before you're ready to bake, preheat your oven to 350 degrees. Line a couple of cookie sheets with clean parchment. Unwrap the dough, roll it in sanding sugar (medium-sized coarse sugar) if you like, pressing gently so the sugar adheres. 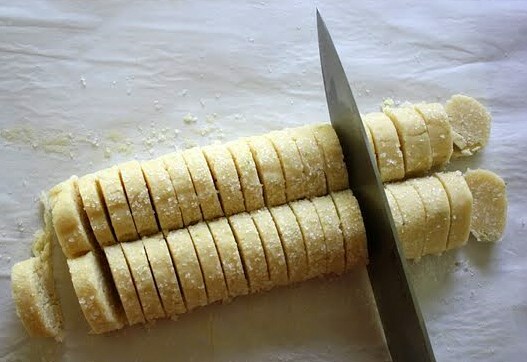 Slice the dough into 1/4" to 1/3" thick pieces using a very sharp knife. 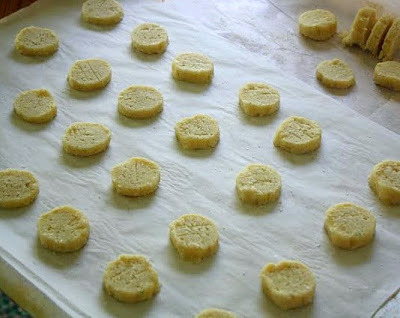 Place the pieces on the lined cookie sheets, leaving about 2" between each one; the cookies will spread out. Bake for about 15 minutes, or until lightly golden. 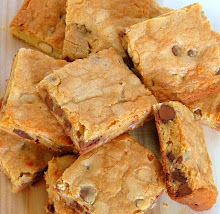 Let the cookies cool on the cookie sheets for at least 5 minutes before attempting to remove them to the cooling rack. They'll be floppy at first, but will firm up and get crispy as they cool. Store the cookies well covered. Chive-Speckled Potato Bread with Winter Vegetable Soup . . . This is Snow Day Food! Wonder of wonders! A snow day that came complete with prior notice. I don't believe that's ever happened around here before. Days like that are such a nice respite, dropping into our laps like found money, no strings attached. They quiet the world down. No school for anyone, not even me! 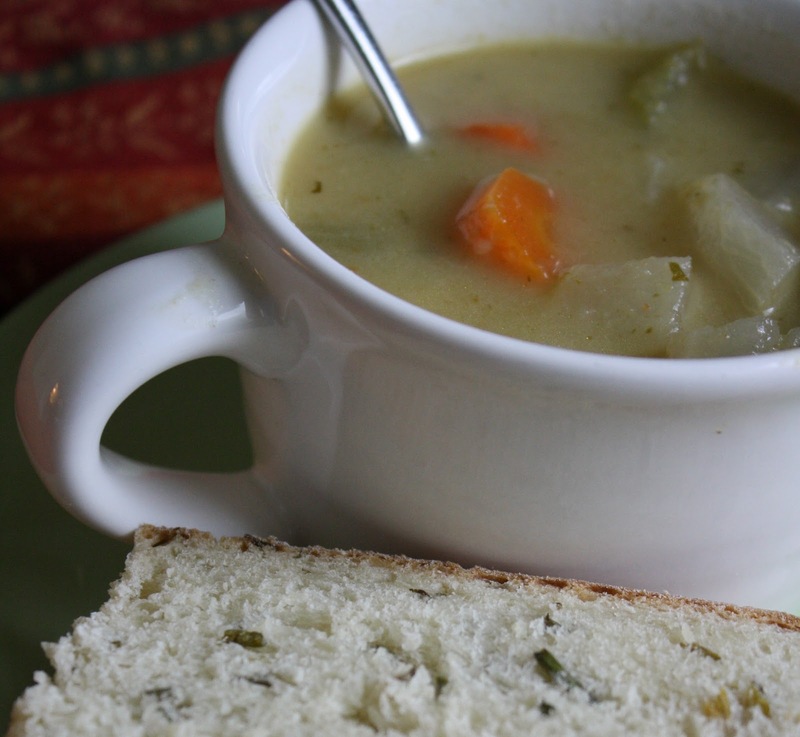 So, instead of fretting over the construction of a sugary delicacy in my Plated Desserts class yesterday, I relished the luxury of slicing, dicing, stirring, and whirring a big pot of winter vegetable soup in my own little kitchen. 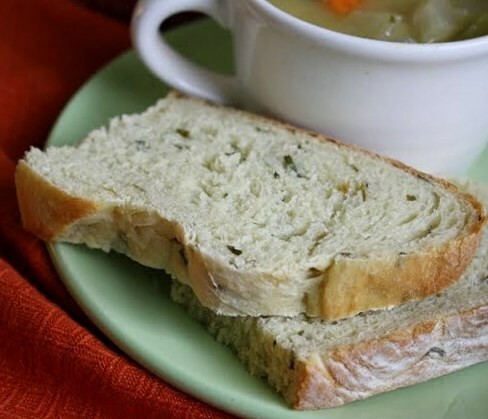 Served up with a generous slice of the moist, chive-speckled potato bread that I'd baked up on Tuesday night, and all was right with the snow-blanketed world. Whatever our age, snow days release us from our most cumbersome daily responsibilities, if only briefly. It did my heart good to know that my 17-year old son, Charlie, spent much of the day outside, sledding with a pack of his friends. He's on the swim team at his high school, so he doesn't get to do all that much these days aside from schoolwork and swimming. Often he's out the door and on his way to the pool by 5:30 in the morning to swim before classes start, then the team swims again after school until about dinner time. A long night's sleep is a pretty rare commodity for him, let alone the time to spend almost an entire day outside. He reveled in the break from routine. Meanwhile, Nathan, my 14-year old, spent a few hours of his own on another local slope with a couple of his pals. Dropping them all off at the neighborhood park, it was cute to witness these man-sized boys ultra-bundled and pulling plastic sleds behind them. When Nathan finally walked in the door last night around 7pm, his cheeks were as pink as a four year old's and he looked just as carefree. (He'll chastise me if he ever reads that, but I'll take the chance.) I hope my kids never conclude that they're too grown-up to play in the snow. This bread recipe is adapted from one I found on The Fresh Loaf, which is one of the most useful blogs around for amateur bread bakers. 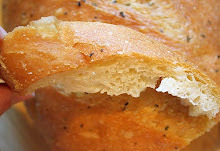 If you have a bread question of any kind, chances are the answer lurks within that site. 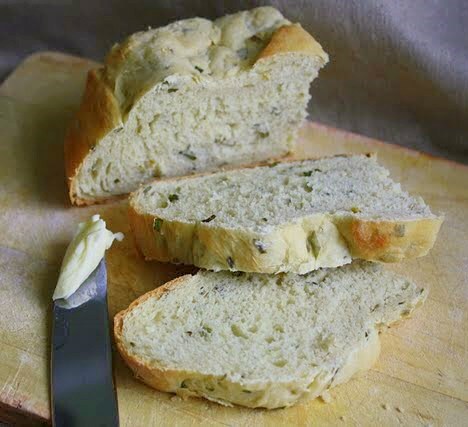 Really good, this loaf gets its moistness from a small amount of baked, and then mashed, russet potato, along with a dollop of sour cream and a handful of chopped fresh chives. 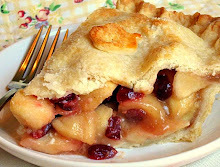 The original recipe called for use of an unpeeled red potato, but I used a peeled russet potato instead. The original also indicated adding in chopped cooked bacon along with some of the bacon fat, but I left that out entirely. I revised the instructions to reflect what I actually did. 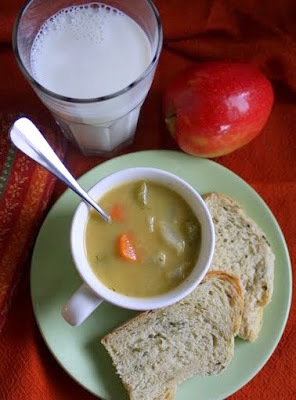 The soup's secret flavor-weapon is the addition of a semi-sweet Riesling; a cup of the white wine is poured in after chopped shallots and garlic have softened in a smidgen of butter in the pot, and before all of the vegetables and broth are added in and brought to an intense and lengthy simmer. 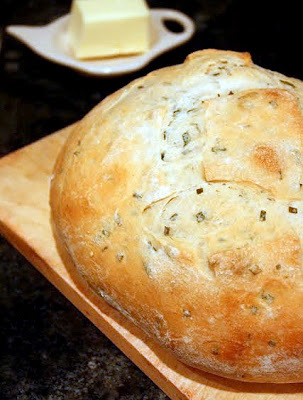 This recipe made one large round loaf, which I baked on a baking stone. Bake one medium-sized russet potato. When it's cool enough, scoop out the insides and set aside. You can discard the skin. Mash 1/2 cup of the cooled potato. In the large bowl of your mixer, using the paddle attachment, combine the mashed potato, 2 cups of the flour, the yeast, and the salt. Add in the water, sour cream, and chopped chives. 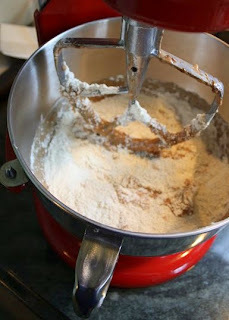 Mixing on low speed, add in the remaining flour a little at a time over a couple of minutes. The dough will be sticky. Turn the dough out onto a well floured work surface and knead it with your hands until it forms a fairly smooth mass. 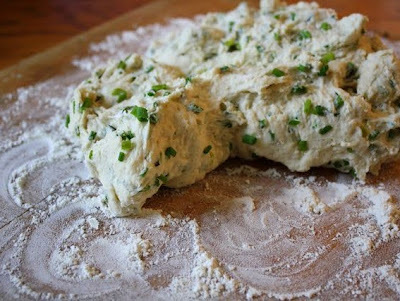 If your dough is extremely sticky, work in more flour; if it's a drier dough, minimize the amount of flour you use for kneading. Put the dough into a lightly oiled bowl, turning it over so it's oiled on all sides. 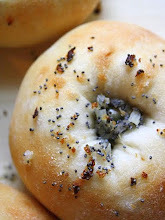 Cover it with plastic wrap that's also been oiled or sprayed with vegetable spray, so the dough won't stick to it. Cover that with a dish towel and place the bowl in a relatively warm spot to rise. Let it rise until it's about doubled. That may take up to 90 minutes. 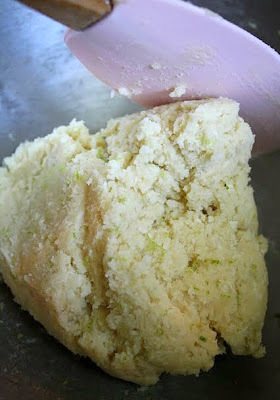 Turn the risen dough out onto a lightly floured surface and press it firmly with your knuckles to remove the gas. Pick up the dough and round it, gently pulling downward on the sides to create surface tension. Let the dough rest for 10 to 15 minutes on the work surface, lightly covered with the plastic wrap from your bowl. 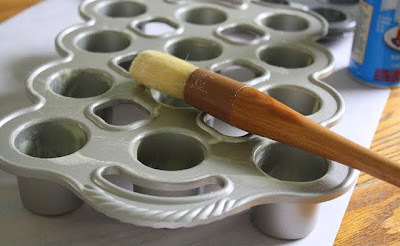 Prepare a basket/bowl for the final proofing. I used a shallow metal mixing bowl, in which I placed a couche (a piece of heavy linen fabric, specially designed for proofing dough; you can approximate this with a big, non-fuzzy, cotton/linen dish towel) that had been very heavily dusted with flour. Once the dough is done resting and it feels relaxed and no longer resistant to shaping, shape it into a smooth round mass and seal the bottom seam by pinching it closed tightly with your fingertips. Place the dough seam side down into the flour-lined couche in the bowl/basket. Cover the dough lightly with the oiled plastic wrap and gently lay the side flaps of the cloche over that. Let the dough proof until it's doubled in size, perhaps 45 minutes to 1 hour. Preheat the oven to 425 and, if you're using a baking stone, place it in the oven now so it has plenty of time to preheat. 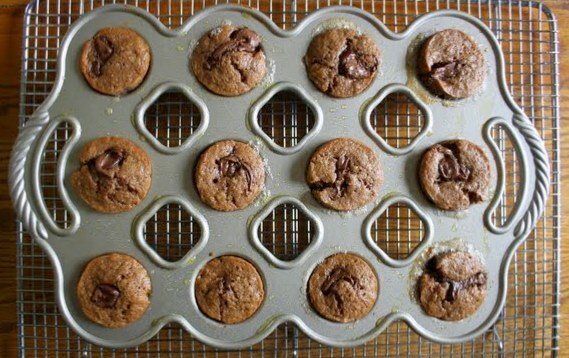 If you're not using a baking stone, you'll need a parchment lined baking sheet. When the dough has doubled, lift it very carefully out of the couche, and place it onto a flour dusted baker's peel (use the peel if you're going to be putting it on a hot baking stone), or directly onto the parchment lined baking sheet. 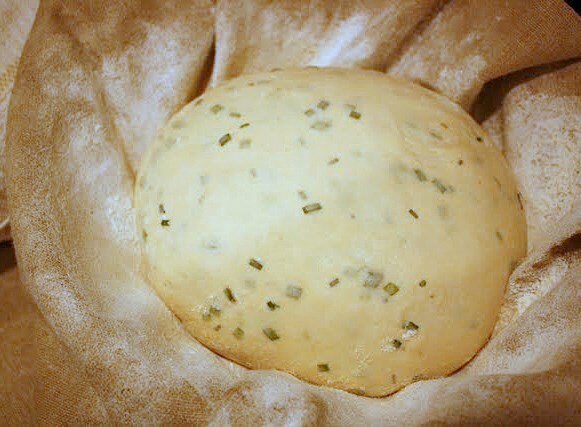 Spritz the top of the dough lightly with water (this will help prevent it from bursting while it bakes). Slide it onto the heated stone, if you're using one. Spritz water into the oven very quickly from a spray bottle to create moisture--just a few brief squeezes, then shut the door gently. Let the bread bake at 425 for only 5 minutes, then turn the oven down to 350 for the remainder of the bake time. The bread may take about half an hour to bake. It should be golden and its internal temperature, in the center of the loaf, should reach about 195 on an instant-read thermometer. Let the finished loaf cool on a rack. 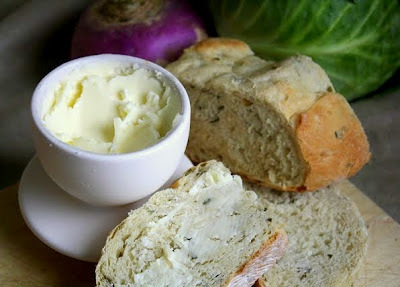 Melt the butter in a large stock pot. Add in the shallots and garlic and simmer until they're translucent. Pour in the wine and simmer for about 15 minutes. Add in all the chopped veggies, and the parsley, along with the broth. 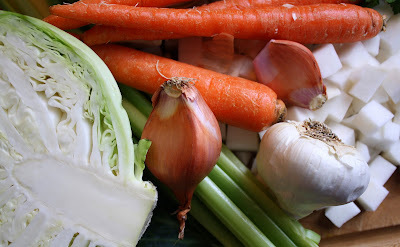 Let the soup simmer on medium heat until all the vegetables are tender; it could be at least an hour. Turn off the fire. Using an immersion blender, puree the soup in its pot until it's got a minimal amount of chunks left. 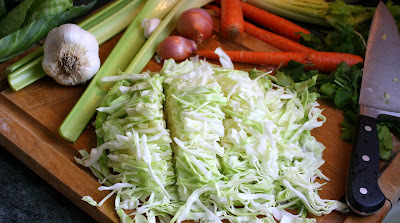 Add in, if you prefer, about 1/2 a cup of half and half to make a richer soup. Add in salt and pepper to taste. 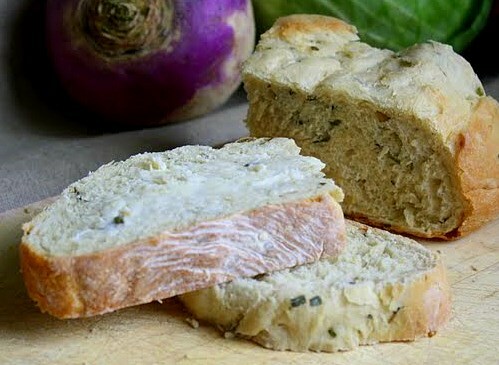 Serve with your fresh bread and enjoy!